Published in Love of Knitting, Spring 2017. 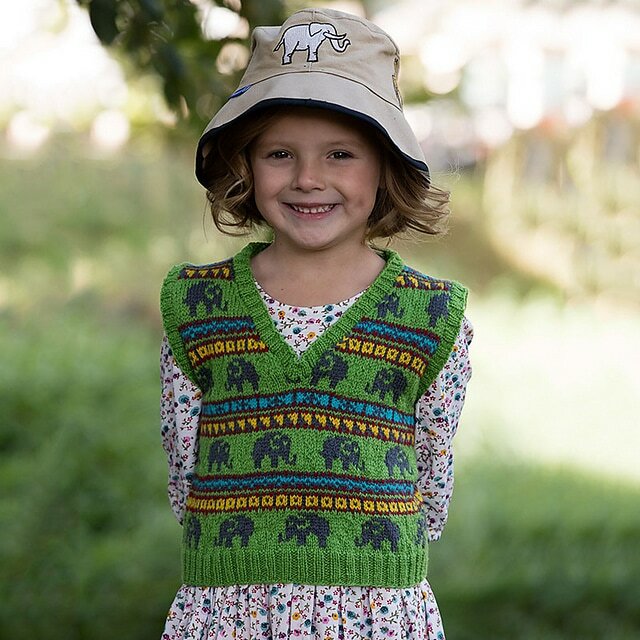 ​Elephants and colorful African motifs march across this children’s vest worked in stranded colorwork. This design uses no more than two colors per round, and it includes a chart for steeks so you’re always knitting from the right side. 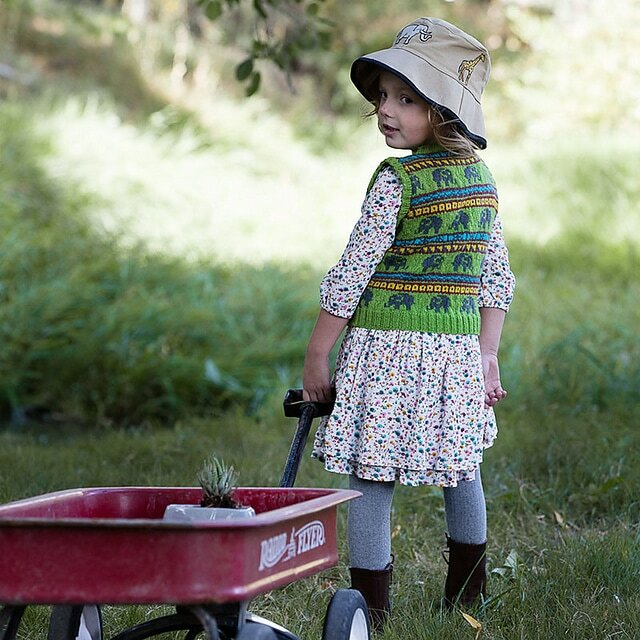 If you haven’t steeked before, it’s a fun (if slightly nervewracking) process—try it on a small project before tackling adult-sized sweaters. Finished Size 24 (26.75, 29.25)” chest circumference. Vest shown measures 24”. Yarn Knit Picks Palette: #25098 peapod (green; A), 3 (4, 5) balls; #23731 ash (gray; B), #24246 pimento (red; C), #25531 canary (yellow; D), and #25095 caribbean (blue; E), 2 balls each. Yarn distributed by Crafts Americana. Needles Size 2 (2.75 mm): 16” and 24” circular (cir) and set of double-pointed (dpn). Size 3 (3.25 mm): 16” and 24” cir. Gauge 30 sts and 31 rnds = 4” in charted patt on larger needles. ​Notes This vest is worked in the round from the bottom up. Additional stitches are cast on at the underarm for armhole steek panels and at the neck for the neck steek panel. Steeks are not included in the stitch counts unless indicated.